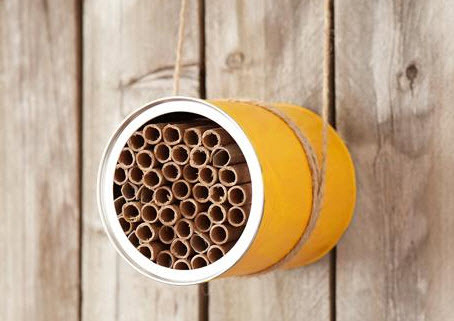 Make a place in your garden for mason bees to call home! Get a container that can withstand the elements, such as a coffee can or flower pot. Clean the container or tape a piece of paper over the drainage hole in the flower pot. Roll a piece of brown paper around a pencil, tape the paper in place and slide the tube off the pencil. Tape a small piece of paper over one side of the tube to close that side and stick the paper tube into a toilet paper tube. Stuff the container with the toilet rolls filled with the homemade paper tubes or with tubes purchased from a gardening store with the closed side in the back of the container. Stuff pieces of moss in any open spaces between the toilet rolls. Tie a string around the bee house, glue the string in place and hang the house in a south-facing location that is sheltered from the rain. Mix some dirt with water in a planter dish to make mud, set the mud plate near the bee house, and set a second plate filled with rocks and water near the house for the bees to drink.